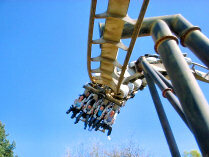 Today marks the twentieth anniversary of Nemesis, the iconic rollercoaster at Alton Towers, opening to the public. The ride was groundbreaking, in both the figurative and literal sense, when it made its debut on Saturday 19th March 1994. Due to the restrictions that prevent Alton Towers from building above the tree line, tons of earth had to be removed during construction from what was a flat site. This allowed the inverted track to drop down deep into the earth, creating the many near-miss "leg choppers" which make the ride so exhilarating. Not only was the ride itself sensational, but it came with a well thought-out backstory, impressive theming and a huge marketing campaign. Very little has changed on the ride over the years, with the exception of the logo, which was altered after just four years to look more "industrial". Nemesis' popularity and recognition amongst the general public was reinforced in 2003, when Thorpe Park - another UK theme park owned by the same parent company - opened a ride of the same type, named Nemesis Inferno. Nemesis has been voted one of the world's top rollercoasters ever since its arrival, climbing to 3rd place in a popular poll in 2006. We look forward to another 20 years of being thrilled and exhilarated on this truly wonderful ride. Happy Birthday, Nemesis. Try not to take lunch between 12pm and 2pm. It gets extremely busy.